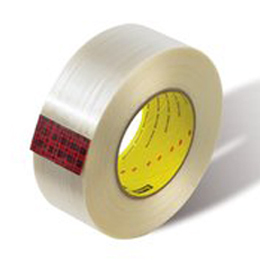 Scotch® Filament Tape 8919MSR is a clear polyester backed tape with a modified synthetic rubber adhesive and is reinforced with fiberglass filaments. The heavy clear polyester film backing provides greater stiffness and excellent abrasion, moisture, and scuff resistance. The modified synthetic rubber resin adhesive is specifically formulated to provide optimum oily metal adhesion, clean removal and stain resistant from a wide variety of surfaces. The tape is specifically designed to hold a variety of metal appliance parts together during manufacture and shipping. Metal working, pipe manufacturing, government and general industrial. Metal bundling, coil tabbing, high strength reinforcing, lift flap closure, and heavy duty strapping.